Take it from me (or Huey Lewis), it is hip to be seen in granny squares! Especially if it is this cute tank top in Interweave Crochet designed by Theresa Schables. Made from Firefly (one of our favorite summer yarns), the vertical squares outlined by solid squares to give the illusion of waist shaping. The linen and rayon blend gives the granny squares the perfect amount of drape and stability at the same time. Joining the squares as you go gives the tank the added bonus of having minimal finishing. Wear with flower power jeans and wedge sandals for a bohemian look or with a pencil skirt and kitten heels for a hip city look. Either way, you are sure to be hip! Photos courtesy of Interweave Crochet. Matt Schodorf Photography. I have mentioned on the blog before that I recently moved to Massachusetts to work for Classic Elite Yarns. The hardest part of moving, whether you are 5, 15, 25 or even older…is making new friends and leaving your old ones behind. 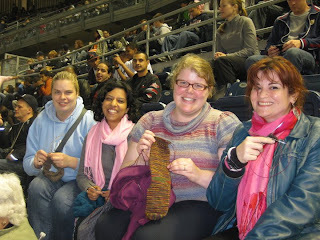 Some of the best friends I had made in NYC (and even in life to date) are from my knitting group. Of course the common bond was knitting and yarn, but our friendships grew from there. Talk quickly turned from yarn to jobs, families and even romance. We also looked forward to seeing each other once a week to get updates on projects, as well as catching up with each others' lives. A tradition in our group was that when someone moved away or had a major life event (such as a wedding or a new baby) we would get together and coordinate a group project - usually a blanket. When I moved, I was so busy with everything, it didn't occur to me that I hadn't gotten a blanket. Although I had been planning on moving away from the city for quite awhile, the amount of time from when I started interviewing for this job to my actual move date was quite brief. So even if they had wanted to make a blanket for me, they wouldn't have had the time. One of the ladies from our group was passing through Massachusetts last week and stopped by for a visit. One of the first things she did was hand me a box. It was wrapped in simple brown paper with yarn wrapped around it. I KNEW what this was. (Full disclosure – I went back to NYC for a good friend’s wedding 2 months ago and they had presented me with a card explaining that they were working on the blanket). I would like to say that I was a picture of patience as I opened the box, but I was more like a little kid at his/her birthday and just ripped into that paper. My wonderful friends had made me a blanket! They made me a 64 Crayons using Liberty Wool. Apparently there was some discussion as soon as I accepted the job that they knew they wanted to make me a blanket and they wanted to use Classic Elite Yarns. The ironic thing was that we had just finished making a 64 crayons for our friend (whose wedding I went back for). I can only imagine how difficult it was for the people who were working on both blankets to not spill the beans to either of us! There are so many great things about this blanket. The first, of course, is that it was made with love by people I love. I am sure it will keep me warm on cold New England winter days, but also warm my heart during those times when I am feeling lonely for my friends. I also really love that they used Liberty Wool. Not only is it a tribute to my decision to work for CEY, it is a great yarn for a blanket. Liberty Wool is machine washable, so when a messy life moment happens, I don't have to worry about how to clean it. I can just throw it into the washing machine. Another great thing about the use of Liberty Wool in combination with this blanket is that it will always go with whatever my décor is. There are so many colors, that they all work together, just like a great quilt would. For the time being, the blanket will be in my living room, but I feel that if I want to put it in the bedroom at some point, it would go with whatever is in there. I know that this is an heirloom piece for me. And one I will forever more treasure! Thank you to my NYC knitting friends. It means more to me than you will ever know.